What’s next for Suits? USA has just released the premiere date and a new sneak peek for season six, Deadline reports. 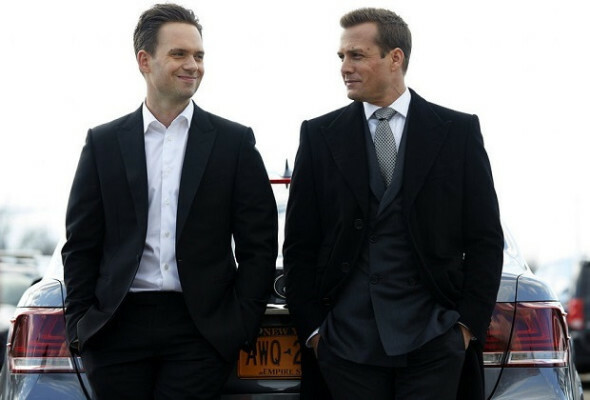 Suits stars Patrick J. Adams as Mike Ross, a college dropout who manages to work his way up at a law firm headed by Harvey (Gabriel Macht) and Jessica (Gina Torres). Season six will pick up where the last season left off, with Mike headed to prison for two years. His co-workers at Pearson Specter Litt are left to pick up the pieces. Malcom Jamal Warner, Erik Palladino, and Paul Schulze will guest star. Season six premiers on July 13th at 9 p.m. ET/PT. What do you think? Are you a fan of Suits? What do you hope happens during season six? I am person of words shows very upset with Burn Notice, White Collar, Psych, Common Law, and Graceland they are great shows should be more them out there. Great shows on that channel can’t believe it end couple years ago plus years ago what going on TV shows today in the world it not great if not on TV I like good shows to enjoy. Please understand be on more season don’t like see the end keep watch it everyone who likes that i would like see this upcoming season for me. Yes, please keep it going love it, would be very disappointed if it ended.